In 7 Days, you can have a beautiful, polished, stylish and professional website. Or maybe, you haven’t even attempted it yet because everytime you do the tech stresses you out so much you end up eating an entire pack of cookies and abandoning it for yet.another.month. Let’s get you launched… in 7 days. There are 3 templates available currently, all of which will be customised to your brand colours, images and text. Or you can purchase one from my Logo Shop, like this one right here. You’ll need to send me your written content for your website & your images. Don’t worry, I’ll provide this workbook which will help you write your content. Plus, we’ll plan out the layout of the homepage too so that you know how much text to write / what to write. My website workbook also includes a template for writing your sales page! Step 4: I build and then we launch! Once you have provided your written content and images, we’ll build your wordpress website for you and fully customise the template with your written content, images and branding. By the time we’re done, you’ll have a fully customised, professional website ready to launch. Are an established entrepreneur (because you need to have your message figured out, know who you’re selling to and why your services are epic, so that you can write your content with ease). Are a service based entrepreneur (there won’t be any ecommerce functions added, but you can add that at a later date if you wish). Have professional images or you’re a pro with the selfie game. A good website is only as good as it’s content. Poor images will instantly downgrade the quality of any site, which we want to avoid! If you feel like you need something more custom, please check out my design services page instead. 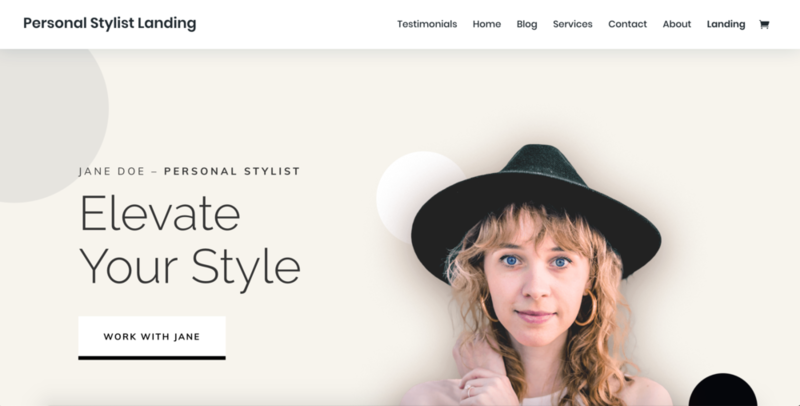 Websites are built on Wordpress, using Divi. You will need to purchase your domain and website hosting and provide the login details (you can use Last Pass) so that my team can set it up for you. Once you make payment, you’ll be sent the website content workbook and a key date for you to submit your written content and images. You will normally be asked to provide this within 3 business days, so ensure you block out some time in your calendar. As soon as I receive the content, I’ll get to work. I’ll aim to have your completed design ready for you within 7 business days. Your site will be customised with your branding and colours. You can purchase a brand kit from The Logo Shop to be used on your site if you don’t have a professional logo yet. *Additional costs to you may include your hosting and domain name purchasing, if you do not have these already. Prices vary, but with Blue Host the price can be between $60 - $99 per year, dependant on which package you choose for hosting and domains can be $10 per year on average with Go Daddy.